The promoters of ETFs in Europe enjoyed net inflows for March. These inflows led, in combination with a positive performance of the underlying markets, to increased assets under management in the European ETF industry. In more detail, the assets under management in the European ETF industry increased from €707.3 bn as of February 28, 2019, to €725.2 bn at the end of March. The increase of €17.9 bn for March was driven by the performance of the underlying markets (+€12.7 bn), while net sales contributed inflows of €5.2 bn to assets under management in the European ETF segment. With regard to the overall number of products, it was not surprising equity funds (€504.3 bn) held the majority of the assets, followed by bond funds (€190.4 bn), commodity products (€18.8 bn), "other" funds (€5.5 bn), money market funds (€4.0 bn), mixed-asset funds (€1.6 bn), and alternative UCITS products (€0.6 bn). The level of estimated net inflows into ETFs continued to be above average for March. In more detail, the net inflows in the European ETF industry for March (+€5.2 bn) were above the monthly rolling 12-month average (+€4.1 bn). The inflows into ETFs were a sign that investors had returned to the markets, as stock markets globally recovered further over the course of March. That said, it was surprising bond ETFs were the asset type with the highest net inflows (+€6.2 bn), followed by "other" ETFs (+€0.2 bn) and alternative UCITS ETFs (+€0.1 bn). 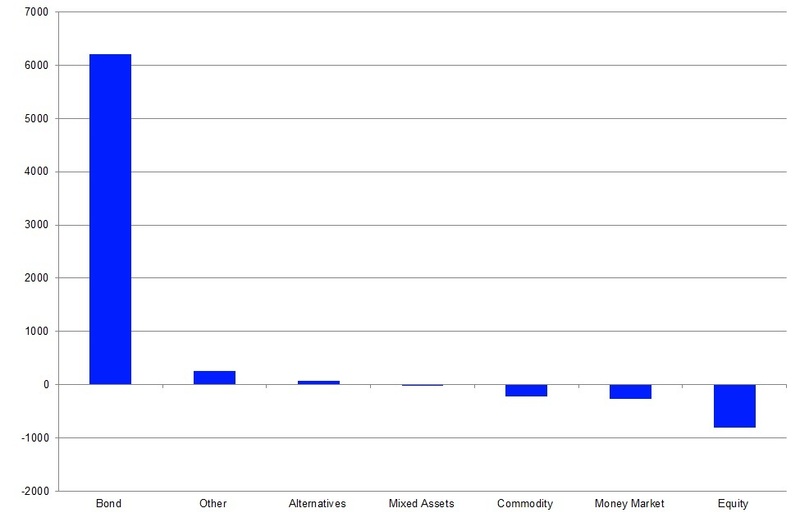 Conversely, equity ETFs (-€0.8 bn) was the asset type with the highest outflows, bettered by money market ETFs (-€0.3 bn), commodity ETFs (-€0.2 bn) and mixed-asset ETFs (-€0.01 bn). This flow pattern drove the overall net flows to +€27.2 bn for 2019. With regard to the Lipper global classifications, the European ETF market was split into 161 different peer groups. The highest assets under management at the end of March were held by funds classified as Equity US (€132.7 bn), followed by Equity Global (€73.5 bn), Equity Eurozone (€49.8 bn), Equity Emerging Markets Global (€40.4 bn), and Equity Europe (€37.5 bn). These five peer groups accounted for 46.04% of the overall assets under management in the European ETF segment, while the ten-top classifications by assets under management accounted for 59.35%. Overall, 18 of the 161 peer groups each accounted for more than 1% of assets under management. In total, these 18 peer groups accounted for €517.0 bn, or 71.29%, of the overall assets under management. 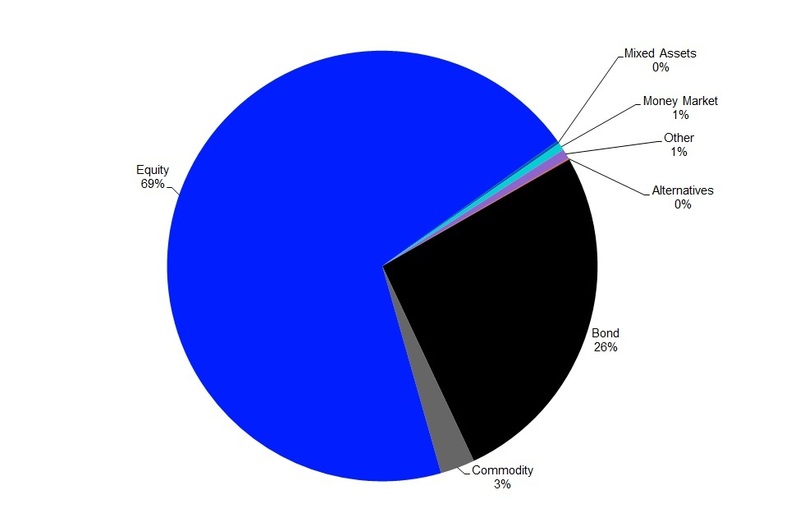 In addition, it was noteworthy that the rankings of the largest peer groups were quite stable, indicating European investors use the funds from these peer groups as core holdings and not just as so-called satellites that are bought and sold frequently to implement asset allocation views in investor portfolios. These numbers showed assets under management in the European ETF industry continued to be highly concentrated. The peer groups on the other side of the table showed some funds in the European ETF market are quite low in assets and risk being closed in the near future. They are obviously lacking investor interest and might, therefore, not be profitable for their respective fund promoters (Please read our report: "Is there a consolidation ahead in the European ETF industry?" for more details on this topic). With regard to the overall sales for March, it was not surprising bond funds (+€5.9 bn) dominated the table of the ten best-selling peer groups by net flows, as well as by the peer group count. Following the flow trend with the leading position of bonds, the best-selling Lipper global classification for March was Bond EUR Corporates (+€2.3 bn), followed by Equity Global (+€1.4 bn) and Equity US (+€1.0 bn). The net inflows of the ten best-selling Lipper classifications equalled 170.47% of the overall net inflows. 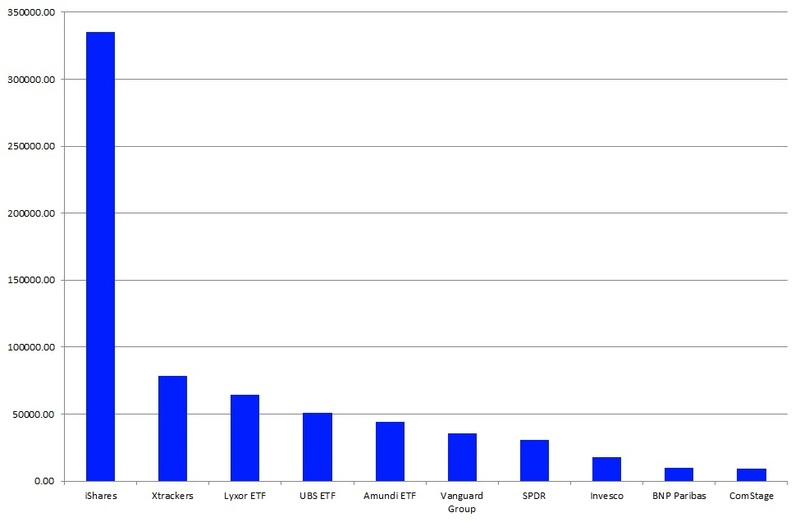 These numbers showed the European ETF segment is also highly concentrated with regard to fund flows by sector. Generally speaking, one would expect the flows into ETFs to be concentrated, since investors often use ETFs to implement their market views and short-term asset allocation decisions. These products are made and, therefore, are easy to use, for these purposes. On the other side of the table, the ten peer groups with the highest net outflows for March accounted for €5.3 bn of outflows. Equity Eurozone (-€1.8 bn) faced the highest net outflows, bettered somewhat by Equity Sector Financials (-€0.6 bn) and Bond USD Corporates (-€0.5 bn). A closer look at the assets under management in the European ETF industry by promoters also showed high concentration, since only 20 of the 51 ETF promoters in Europe held assets at or above €1.0 bn each. The largest ETF promoter in Europe—iShares (€335.2 bn)—accounted for 46.22% of the overall assets under management, far ahead of the number-two promoter—Xtrackers (€78.5 bn)—and the number-three promoter—Lyxor ETF (€64.3 bn). (To learn more about the concentration of the European ETF market at the promoter level, please read our report: Spotlight on the concentration at the promoter level in the European ETF industry). 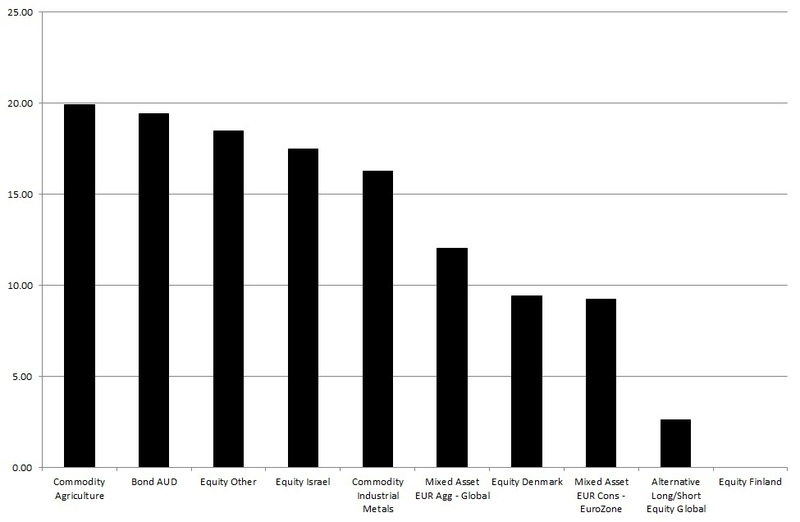 The ten-top promoters accounted for 93.22% of the overall assets under management in the European ETF industry. This meant, in turn, the other 41 fund promoters registering at least one ETF for sale in Europe accounted for only 6.78% of the overall assets under management. 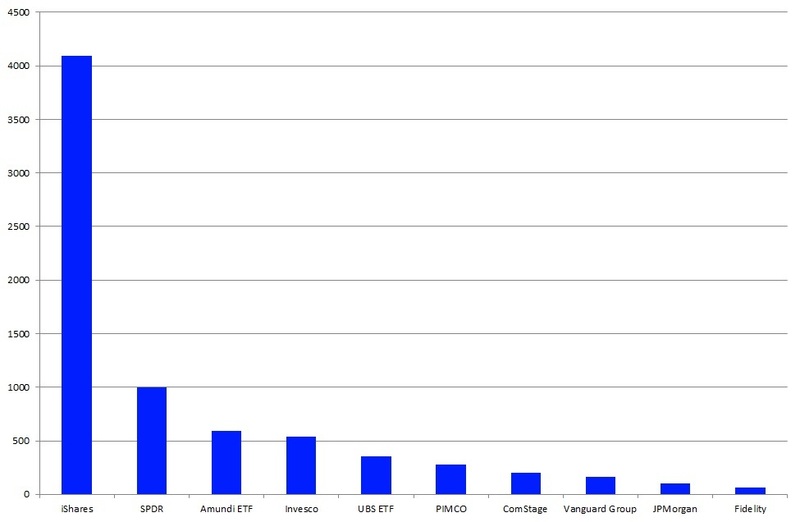 Since the European ETF market is highly concentrated, it was not surprising that seven of the ten largest promoters by assets under management were among the ten-top selling ETF promoters for March. iShares was the best-selling ETF promoter in Europe for March (+€4.1 bn), well ahead of SPDR (+€1.0 bn) and Amundi ETF (+€0.6 bn). Since the flows of the ten-top promoters accounted for 141.47% of the overall estimated net flows into ETFs in Europe for March, it was clear that some of the 51 promoters (18) faced net outflows (-€2.4 bn in total) over the course of the month. There were 2,798 instruments (primary funds and convenience share classes) listed as ETFs in the Lipper database at the end of March. With regard to the overall market pattern, it was not surprising the assets under management at the ETF level were also highly concentrated. Only 162 of the 2,798 instruments held assets above €1.0 bn each. These products accounted for €440.7 bn, or 60.77%, of the overall assets in the European ETF industry. The ten largest ETFs in Europe accounted for €120.5 bn, or 16.62%, of the overall assets under management. 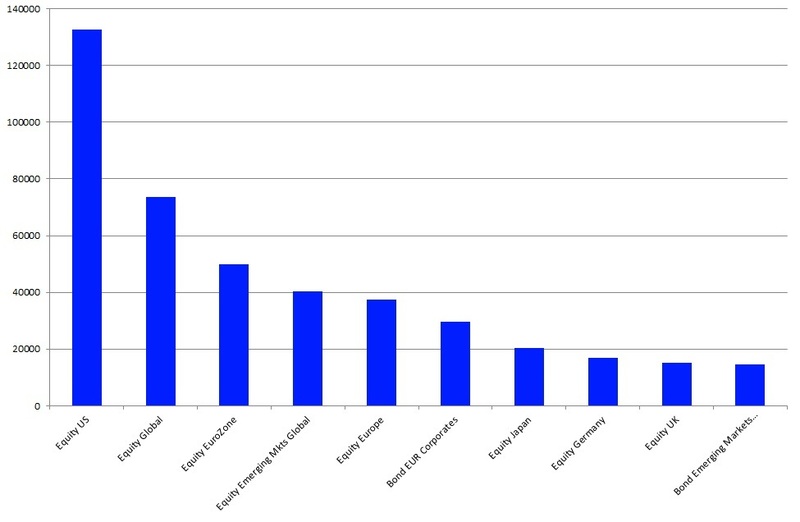 (Please read our study: Is the European ETF industry dominated by only a few funds? to learn more about the concentration at the single-fund level in the European ETF industry). A total of 824 of the 2,798 instruments analyzed in this report showed net inflows of more than €10,000 each for March, accounting for €20.0 bn, or 382.14% of the overall net flows. This meant the other 1,974 instruments faced no flows or net outflows for the month (By looking at this statistic, one needs to bear in mind that some of these instruments are convenience share classes that do not report assets under management. 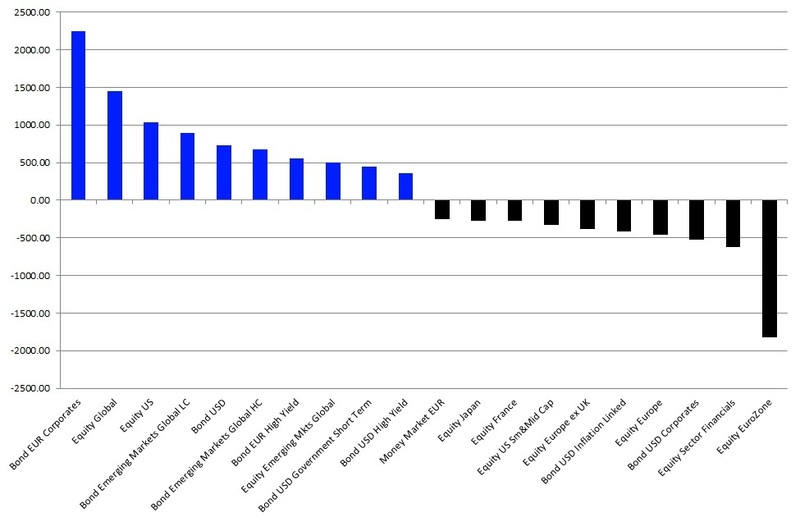 This means Lipper can't calculate fund flows for these ETFs). In more detail, only 39 of the 824 ETFs posting net inflows enjoyed inflows of more than €100 m each during March, for a total of €9.4 bn. 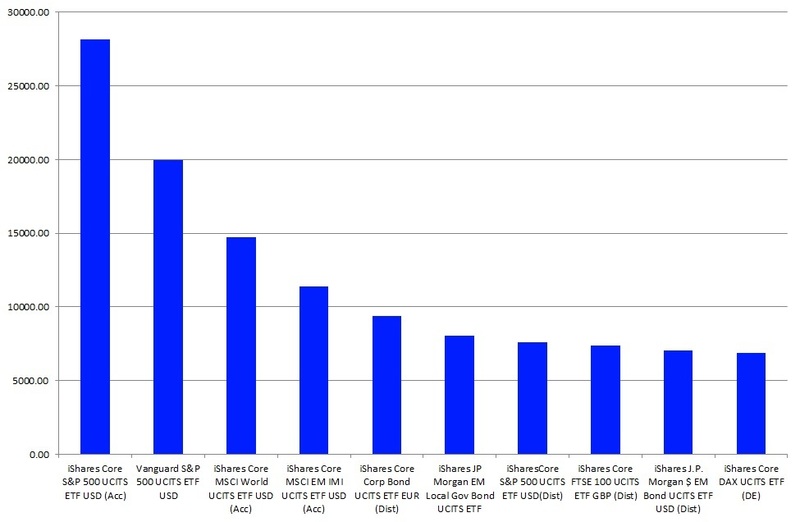 The best-selling ETF for March, iShares Core Corp Bond UCITS ETF EUR (Dist), accounted for net inflows of €1.1 bn, or 21.34%, of the overall net inflows. It was followed by iShares Core MSCI World UCITS ETF USD (Acc) (+€0.8 bn) and iShares JP Morgan EM Local Gov Bond UCITS ETF (+€0.7 bn). The flow pattern at the fund level indicated there was a lot of turnover and rotation during March, but it also showed the concentration of the European ETF industry even better than the statistics at the promoter or classification level. 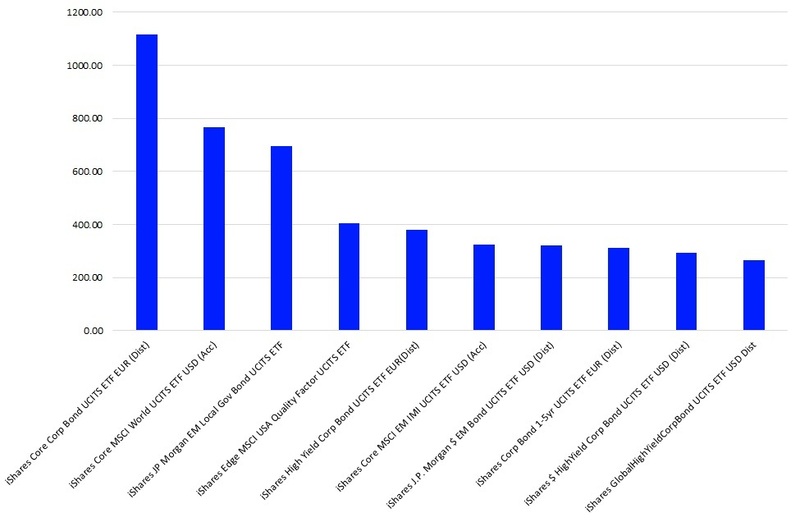 Even given its size, it was surprising that all of the ten best-selling funds for March were promoted by iShares. This accounted for total net inflows of €4.9 bn, or 93.37%, of the net inflows into the European ETF segment.